It’s an old wives’ tale that if your ears are ringing, some one is talking about you. Ear ringing (or tinnitus as it is clinically called) is a bothersome occurrence for many, but for some it is a very serious problem that torments them without relief. Most physicians will evaluate a patient with acute onset of tinnitus (ear ringing) and vertigo (dizziness) with a thorough neurological evaluation, including brain MRI to rule out uncommon but serious diseases of the brain. Although ear ringing and dizziness can be associated with serious central nervous system disease, the majority of cases are more transient and neurological evaluation fails to uncover any overt disease process. This is true of most cases that we see at The Center. A comprehensive Occupational and Environmental Medicine evaluation is usually able to identify the illusive causes. We find that exposures to common airborne, food, or chemical triggers very often sets off the ear ringing and/or dizziness in these patients. One of the many causes of these problems is the Herpes simplex virus, which literally lives in the cranial nerves of the brain. When the body’s defenses are weakened by any stress, including allergy, the virus can activate, resulting in the onset of symptoms. virus, or against the virus itself. Identifying an individual’s allergens or environmental triggers, and avoiding these or desensitizing reactions to them through the use of appropriate allergy extracts, can often “turn off” the ear ringing and dizziness. It is important to recognize any seasonal pattern of the symptoms. A seasonal occurrence is often related to airborne pollens—trees in the spring, grasses in summer, and weeds in the fall. By controlling seasonal allergies with specific immunotherapy, the patient’s symptoms can be controlled. In order to treat the Herpes simplex virus, Dr. Joseph Miller, a pioneer allergist from Mobile, Alabama, discovered the technique of viral neutralization. Using Influenza virus vaccine in minute doses, he was able to not only turn off the activation of the Influenza virus but also the Herpes simplex virus, as well. Some cases of ear ringing will not respond to pollen desensitization therapies or viral neutralization. In this population, it may be found that they are literally reacting to the presence of bacteria in their bodies. 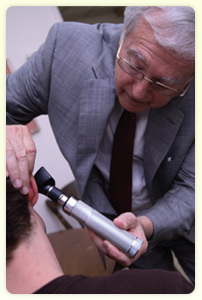 For these cases, identifying the specific microorganisms and neutralizing them often turns off the ear ringing. When neurological tests are normal, environmental triggers from airborne factors, foods, chemicals, viruses, and bacteria, as described above, should be sought. Our Environmental Medicine approach often relieves these troubling problems safely and effectively. Also see the related article in this section of our Website, A Challenging Case History–Vertigo.